An Argentinian steak house nestled in Portsmouth...........sounded worth a go!! Dean chose this restaurant after hearing so much about it from a family member, and thought it sounded good enough for Grubgang to try out. The decor is good and as soon as we walked in, we saw how popular the place is! In fact, although we had booked, we had to go elsewhere for a pre-dinner drink whilst they waited for a table to become available. Not necessarily a great start, but being busy was bound to be a good sign, maybe? When we finally we finally sat down to eat, the menus were placed on the table (rather than given to us, which was a bit different) The staff let themselves down, being very quiet despite the loudness of the room and not projecting themselves a little to be heard. Wednesdays is a big day in Osbourne Road restaurants as it is the day they all offer great deals on meals. 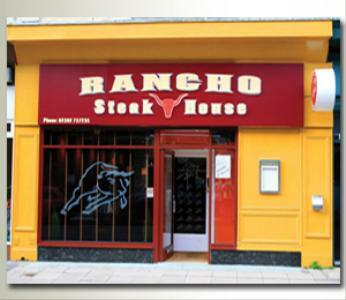 At Rancho's, it is unlimited ribs for £13.95........an offer too good to miss out on for myself and Gemma! Dean opted for Steak whilst Mike chose a lovely fish dish. Then, a bombshell..........they had run out of unlimited ribs!!! Not what we wanted to hear, so we asked for the menu. Then, the waiter returned saying we could have ribs, but not unlimited ones! We were a little upset by this, but agreed anyway. The food was very very good..............could not be faulted! The meat just fell off of the ribs and was delicious! Dean was very happy with his steak, one of the best he had had in ages! Mike also was very impressed with his dish, the fish being very tasty! The desserts were good too......although Gemma and Clair would prefer something other than passion fruit sauce trailed over the lovely white chocolate cheesecake! The upsides? Good food, clean tables and facilities and good company. If you want unlimited ribs though, I would book an earlier table and hope you get there and are able to sit down! If the staff chilled out a bit and began to relax with their customers, speaking up a bit........we could have given a higher mark.